It is possible for cats to be allergic to dogs. 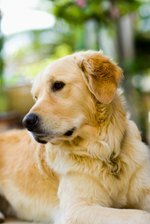 Your pooch likely is carrying an allergen, such as pollen, that is activating your cat's allergies. Dogs and cats can also experience flea allergy, so flea prevention is important for the health of both animals. If you suspect your cat has an allergy, take her to the vet to rule out another medical problem. If the dog is the culprit, keep him well-groomed to reduce the presence of allergens in your home. Your veterinarian may recommend anti-inflammatory medications for your cat if appropriate. A young puppy and kitten sitting together on grass. According to New York-based Veterinary Internal Medicine Specialist Dr. Donna Spector, cat allergies are one of four kinds: flea, food, airborne or contact allergies. Cats who react to the family dog likely are responding to the airborne allergens carried in by the canine, such as tree and grass pollens. Cats breathe in airborne allergens and experience itching of the entire body. To reduce the allergens on your dog, and therefore reduce symptoms in your cat, brush and bathe him weekly. Brushing the dog will help prevent the buildup of allergens throughout your home. Since allergens become airborne when your dog sheds, you'll have to keep up your housekeeping as well. Vacuum and clean your furniture, drapes and carpets on a regular basis. Dr. Spector also recommends brushing your cat to prevent matting and to distribute natural oils on her skin.